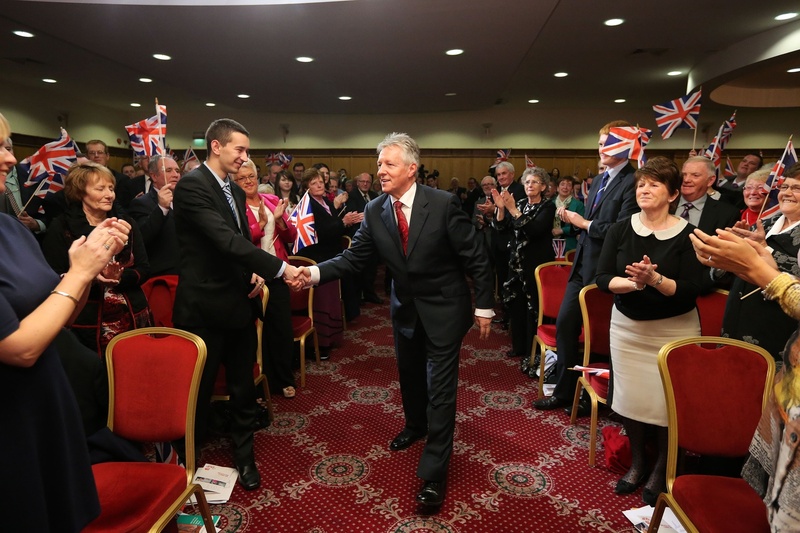 IN a polished performance at his party conference the DUP leader Peter Robinson made a fleeting reference to his fondness for cycling. The past year has felt like an uphill struggle for unionism. But he devoted his entire address to reassuring supporters that the road ahead won’t be half as bad – if they just trust him and his party. Outsiders might wonder how Northern Ireland’s top politician could address his annual conference in the current climate and not make a single reference to Richard Haass. But while the talks led by the former US envoy will be of pressing importance as they approach their December 25 deadline – the DUP also faces two strategically important elections next year. And as the party knows, the political process is for life, not just for Christmas. The DUP has to decide whether to run two candidates in the European Parliament election in May. And at the same time it will face polls in Northern Ireland’s new-look model of 11 councils. “Fewer councils, but with more powers, make these the most significant local government elections for a generation,” the DUP leader told his conference. The loss of a unionist majority in Belfast City Council at the previous elections cleared the way for last December’s landmark decision to restrict the flying of the Union flag at City Hall. The move sparked a year of unionist unrest, when city centre riots spilled into disputes over parades and created violent TV images which shocked an international community that thought such ‘troubles’ were a thing of the past. Mr Robinson defended the right to protest against the flag decision – and perhaps, by extension, his party’s controversial leafleting campaign attacking the policy change. But he characterised the descent into violence as a tragedy, which he blamed on “those who agitate and organise unrest and disorder for their own political ends”. The remark was a thinly veiled attack on loyalists who have political ambitions of challenging his party. Other unnamed critics, who had abandoned his party after it entered government with Sinn Féin, were dismissed as the “feeble and faint hearted”. Throughout the speech he refused to give his opponents the satisfaction of naming them – apart from brief references to Sinn Féin and the UUP. He may have wanted to ensure that nothing distracted from his main agenda. At least eight pages of his ten page text were dedicated to his party’s record of ‘delivery’ – including a ‘fairer’ alternative to the Good Friday Agreement, and a string of policy successes at Stormont listed in a leaflet he waved for the cameras. The unremittingly positive message left little room for the type of complicating details he had dwelt on in the recent past. Last year Mr Robinson gave a conference speech which boasted that a majority of Catholics now wanted Northern Ireland to remain in the UK. But he warned supporters at the time to capitalise on that advantage by making nationalists feel as comfortable as possible in the new Northern Ireland – comments that were a nod towards shifting demographic trends. Days later, census results showed the Protestant population had dropped to 48% – falling below the symbolic 50% mark for the first time – while Catholic numbers were placed at 45% and rising. But his latest conference address was not a place for complex messages or strategy. He pointed instead to the big picture, insisting that it is entirely positive for unionism. There may have been an underlying hint that unionists shouldn’t worry too much about the Haass process. Mr Robinson may not have specifically mentioned Haass, but he gave time to reviewing the issues faced in the talks. He reflected sympathetically on the continuing pain felt by victims. There was applause for his declaration that “we will block…any amnesty for terrorists”. But there was recognition too of the need for compromise on other issues: "If we are to realise our full potential as a society we must work with and not against one another. The remarks may point to the potential for a deal in the Haass process that covers flags and parades, but one which may struggle to extend into tougher territory such as dealing with the legacy of the Troubles. Though there was, perhaps, a hint that there may be political space for some moves to meet the needs of victims. We’ll know more about Haass in the weeks to come. We might have to wait longer for remaining doubters to be fully convinced about Mr Robinson’s personal plans for the future and the direction in which he can take his party – but he has repeatedly said he wants to remain as leader. And while other senior figures flanked him on the stage, former Finance Minister Sammy Wilson – recently billed by the media as a would-be successor – watched from the back of the room. On the wider front, the Haass talks may throw up issues that force unionism to take stock of the shifting dynamics in Northern Ireland society. 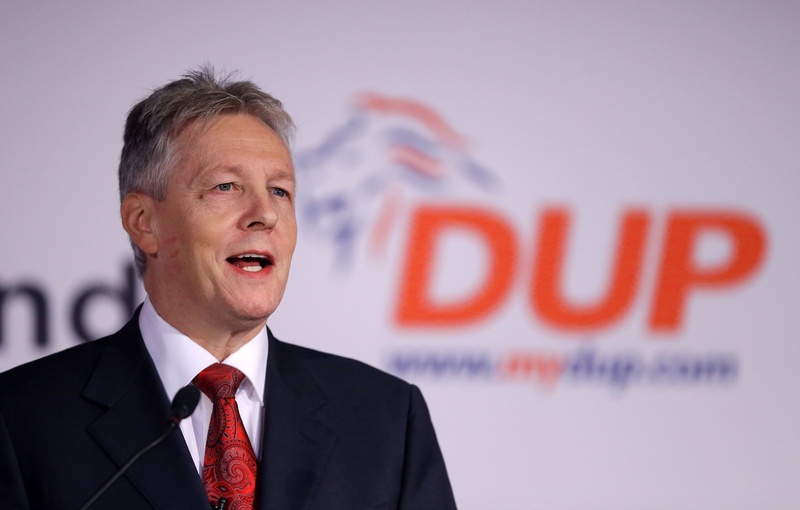 But for now, we have been reminded of one certainty: Peter Robinson is the unopposed leader of unionism and will not allow his party to be easily knocked off course as it enters a fresh electoral cycle.